The Havanese is the National Dog of Cuba and the country’s only native breed. The Havanese is a descendent of breeds brought to Cuba from Spain. They are related to the Bichon family and were once known as the Havana Silk Dog and the Spanish Silk Poodle. This breed evolved from being a pampered lap-dog into a family companion responsible for being a watchdog, child’s playmate and herder of the family’s poultry flock. The dogs are small, sturdy and have a friendly disposition. They range in size from 8½ to 11½ inches tall at the shoulder. Their wavy, silky coat is profuse, but remains extremely light, insulating and protecting the them against harsh tropical heat. The coat, which comes in all colors, should remain untrimmed. The Havanese is trainable, intelligent and naturally affectionate. Their easy going playful temperament makes them an ideal choice for a family pet. Although small, they are energetic and enjoy daily exercise. Their non-shedding coat makes them suitable for allergy sufferers. The pet’s coat can be clipped into a puppy cut. However, regular grooming is necessary to keep the coat in top condition. This brushing is enjoyable to your dog and to you. 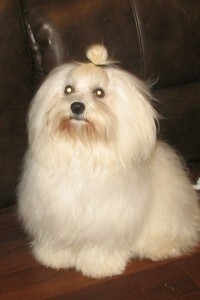 The Havanese is a member of the Toy Group and was recognized by the AKC in 1996. Since this time their popularity in the show ring has grown and they are in high demand as family pets. Havanese enjoy competing in AKC Conformation shows, Fly-Ball and Agility trials. They also make wonderful therapy dogs. They love being loved and giving love.